When it comes to treestand safety, are you asking for trouble? Trust me, I get it: It’s a hassle to adhere to all of the treestand safety advice and climb only when wearing a full-body harness that’s connected to a safety rope. Fact is, it’s also a hassle to lock my doors when I leave the house, or buckle a seat belt before driving away in my pickup. The same is true it terms of wearing a helmet when riding my mountain bike, or putting on safety glasses before firing up the string trimmer to work on the lawn. Life is full of choices. And I’m not here to preach. Forty years ago, when I started bowhunting, few hunters wore a safety belt around their waist in a treestand. And as I recall, that’s before we learned that such a device didn’t really help keep us safe. In fact, if the belt stayed in place around the waist during a fall, the hunter would often be turned upside down and left hanging there. Not good. Sometimes the belt would slide up around the hunter’s chest and then tighten under the arms; again, not good. If you didn’t have a hunting buddy close by to help, or could somehow get your feet on nearby treesteps, then your chances of survival were slim. Thankfully, treestand companies realized there must be a better way, and they developed full-body harnesses. During the past 2 decades, I’ve used numerous models, and while some were easy to use and others left me cursing as I struggled to untangle the many straps, I always felt safer climbing with one. For the last 10 years or so, I’ve stepped up my safety game and now use safety ropes on many of my treestands. Note that I wrote “many” and not “all.” It’s my goal to get every treestand rigged with a safety rope, but facts are facts, and I haven’t completed that important job yet. Like most of you, I bowhunt from a variety of treestands: portable hang-ons, ladder stands, climbing stands and even a few tripods. To access my hang-on stands, I use either screw-in treesteps or strap-on ladder sections. Do I wear a safety harness every time my feet leave the ground? No. For example, I have a few tripods that are 10 feet high; they feature a swivel chair in the middle and a large platform. I can't attach a harness to anything helpful on these tripods, so it would do me no good to wear one. I also have a few ladder stands (seats and platforms large enough for two hunters) that are 10-12 feet off the ground. These stable stands are easier to climb than my ladder used at home to clean gutters; quite often I choose to not wear a harness when hunting these ladder stands. Yes, I know that I could be seriously injured or killed from a 10- to 12-foot fall. I mention these exceptions because I think treestand safety needs to be discussed openly and honestly. It’s easy to say “always wear a harness,” or “always use a safety rope.” Fact: I don’t wear a helmet when driving my ATV 1-5 mph to work on a food plot. Should I? Life is full of risk. And it’s up to each of us to decide how to manage that risk. Don't climb a treestand while toting a bow. Use a bow hauling rope instead. Through the years, I’ve used numerous types of safety harnesses. My favorites include those by Hunter Safety Systems, Muddy Outdoors and Summit. In general, I prefer the ones that are slim and lightweight. Most often, I wear the harness under an outer jacket and have the safety strap exit the jacket at the back of my collar. I prefer to have easy access to my jacket pockets, and find that wearing a harness on the outside is cumbersome. As someone who has a healthy respect for heights, I love my treestand locations that are rigged with safety ropes. I own Lifelines from Hunter Safety Systems, as well as the Safety Lines from Summit. Both designs are easy to rig and use. Tell someone where you're going, and always carry a charged cell phone in case of an emergency. I’ve been climbing trees (lots of them) for 40-plus years, and knock-on-wood ... I’ve yet to fall. But that’s not the complete story. You see, I’ve had two screw-in treesteps break while I was standing on them. Scary for sure. Thankfully, I was hanging onto other treesteps with my hands both times the faulty treesteps snapped under my boots. Had I not been hanging on, I would’ve fallen to the ground — and probably smashed into one or more treesteps along the way during my tumble. No question, it would have been ugly. 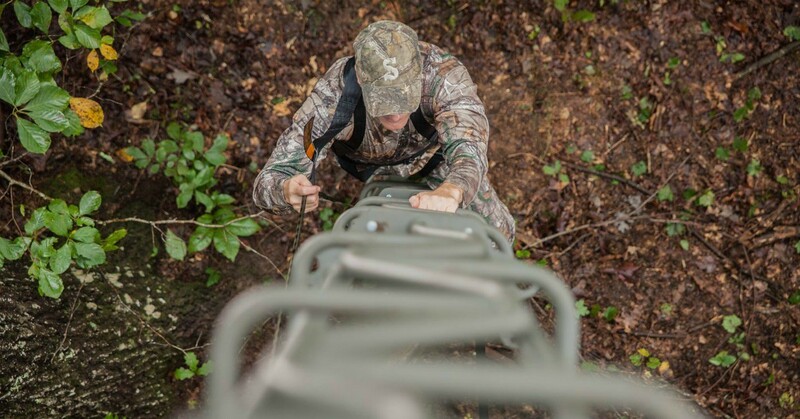 This fall make smart decisions when it comes to treestand safety. Use common sense. Don’t climb with your bow; use a hauling rope instead. If treesteps or ladders are slippery due to rain or ice, then bowhunt from a ground blind. If the wind is blowing more than 25 mph, then hunt from the ground. Tell someone where you’re going, and keep your cell phone handy in case you get into trouble. And yes, wear a harness and use a safety rope whenever possible. Finally, check out the video below from Summit. It showcases what can go wrong if you don’t take the proper precautions. Be safe out there this fall.